Does it take some intricate, long-thought-out strategy to double your business earnings? James Schramko shares his simple technique for doubling your business in a short period of time - and it starts with a pen and paper. 01:13 – Where do you get the best prospects? 01:27 – What converts best? 02:15 – How can you double THIS? James Schramko here. Welcome back to SuperFastBusiness.com. Today’s special episode is called How to Instantly Double Your Business. This is episode 556. Be sure to get the Business Doubler check sheet that comes along with this particular episode. This is a short episode, and short can be good. Because in this episode, we’re going to go through a simple exercise that will help you immediately see opportunity in your current business. 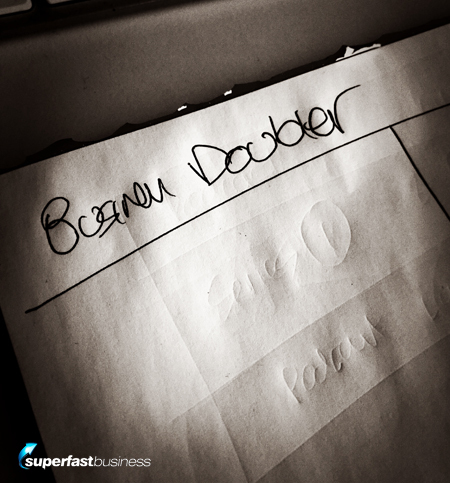 So please download the Business Doubler check sheet and work with me. 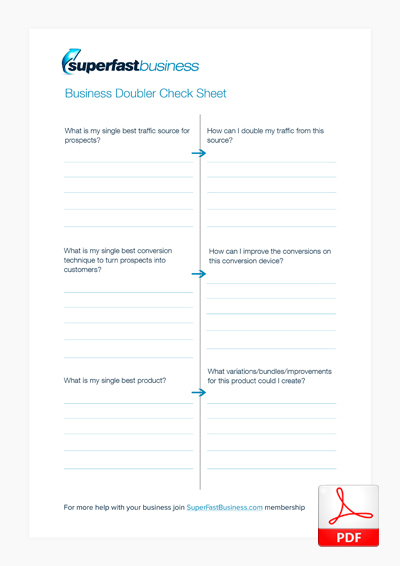 Step one is to get the Business Doubler check sheet, and you’ll see that it has got a line down the middle of the sheet. You grab a pen. Now if you don’t have the check sheet, and you want to do this at home, just grab a blank piece of paper and rule a line down the middle. Where do you get the best prospects? Step two, on the left hand column, write down your single, best traffic source for prospects. Where do you get the best prospects? What traffic source is that? That’s the first item on your left hand column. Underneath that in the lefthand column is, what is the single best conversion technique to turn prospects into customers? Where do you convert that prospect into a customer? What is the offer that you’re making? Where is it in your funnel? What is the best conversion technique? Is it a webinar? Is it a waiting list? Is it from stage? Is it an email sequence? Is it just a sales letter sitting there open to the public? What generates the best profit? The third thing on your left hand column is your single best product. Which product or service of yours generates the absolute, best profit? The one you like selling the most. The one you think has got the best scaling potential. Write that down. How can I double my traffic? Now step three of this process, of the business doubling process, is on the right hand column. Beside your traffic source, write this down: How can I double my traffic from this source? And you want to write down as many answers as come to mind. Put a few there. Brainstorm it. Let it out. How can I improve the conversions? Underneath that, on the right hand side of your best conversion technique, write this down: How can I improve the conversions on this conversion device? Maybe, you can do some testing. Maybe, you can adjust some of the elements of the offer. There’ll be things that you could do to improve the conversions. What variations could I create? And finally, on the right hand side of your single, best product or service, what variations, bundles, improvements for this product could I create? I had an example of a customer who was selling a particular toy really successfully on ecommerce, and it was far more successful than all the other products on his whole ecommerce store. So I had him focus on this. What variations, bundles, improvements? Could you have them in different colors? Could you have them in different sizes? Could you make a bundled set of the whole family of the toys? And then create that. Now step four, this is the fun part – you implement the actions you’ve written down. Commit them to your diary, your schedule and your team. Hand out the tasks. Get the wheels in motion. So in summary, I expect your business will more than double if you focus on the existing winners. There’s almost nothing simpler than doing more of what is already working. It’s just too obvious for most people. So they tend to look past that and seek more complicated solutions or go onto the next business type and get distracted in the inbox or on Facebook. Please do this exercise. The business doubler really can have a big impact. I’ll give you some examples from my own checklist. My best traffic source is podcasting. So I do plenty of it. My best conversion device is a deadline waiting list, email sequence, which I’m constantly tuning. And my best product is SuperFastBusiness membership, which of course you should join if you’re not already a member, and I’d love to help you personally with your business. I will coach you inside SuperFastBusiness because this is just the start of what I can help you with. So, off you go. Let me know how this works for you. I welcome comments on the blog. Of course, you can start a private discussion with me inside SuperFastBusiness membership, and let’s get to work on your own business. I’m James Schramko. This was the episode called How to Instantly Double Your Business using the Business Doubler check sheet. Think business is a solo sport? Change your outlook when you join our thriving community of entrepreneurs.